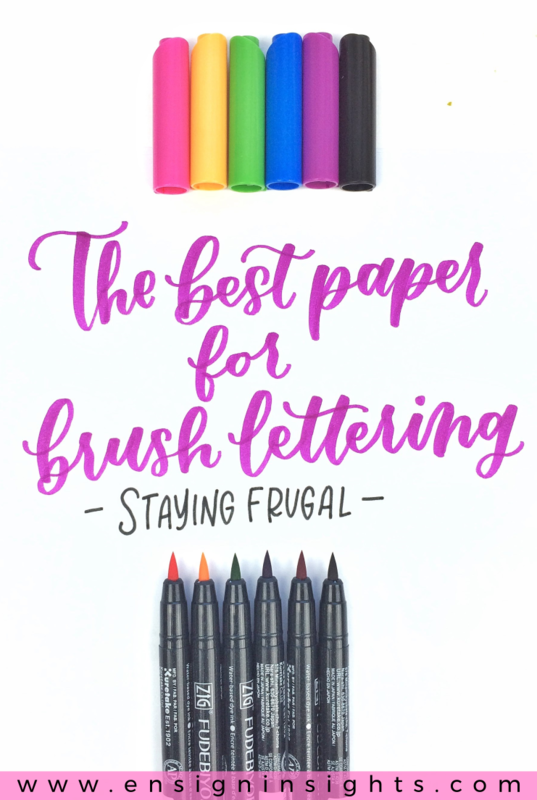 Do you want to know the best paper for brush lettering? What paper should you be using to not fray your brush pens? You also don’t want to spend a fortune? You’re in the right place. 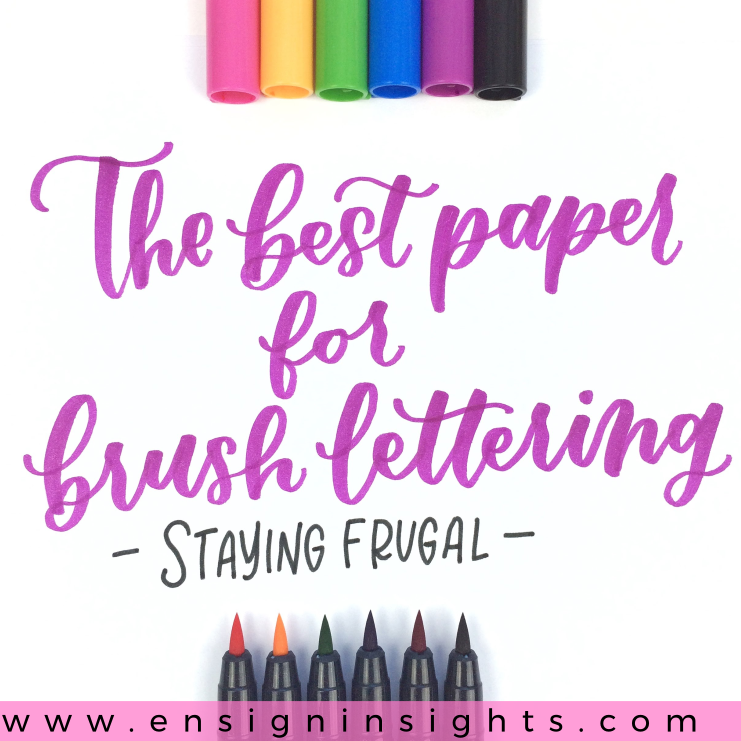 In this post I’m going to share the best paper for brush lettering while staying frugal. Paper is important for brush lettering because if you use the wrong paper, your brush pens will fray a lot sooner. But I want to show you that it doesn’t have to be expensive. If you would like to know which pens to use first, see the best brush pens to learn hand lettering. This is just regular printer paper. It’s super inexpensive. This is all I used to use and I shredded several of my brush pens. But it does have benefits. Not awesome because: It shreds your brush pens! Uses: Sketching with pencil, practice with Crayola markers because you don’t have to worry about them fraying. Awesome because: It’s so smooth! You don’t have to worry about fraying your brush pens. Not awesome because: A little more expensive. This is my favorite! It’s incredibly smooth and gives such a juicy look. I don’t use regular tracing paper. I’m frugal. I use a roll of pattern paper or medical examination paper. I am also a seamstress and I had to get it for my pattern making class in college. Our university health clinic would sell them to students for $2. Next time you are at the doctor, ask if they sell any. They may even give it to you for free. Or find a roll of tracing paper on Amazon. It’s about $10 and will last a whole lifetime. Seriously. I’ve had mine for at least 5 years and I’ve used half of it. And I use it for sewing patterns which is a lot more paper than just a small piece for lettering. Awesome because: It won’t fray your brush pens! Trace your designs. So inexpensive! Makes your colors more juicy. Gives the ombre look easier. Not awesome because: It bleeds through. You have to cut each piece. You can’t use it for a final piece. You can also get a pad of tracing paper so you don’t have to cut each sheet here: Strathmore Tracing paper. Another great option is Rhodia notepads. They come in all different sizes. You can got a grid, dots, lined, or blank. The paper is incredibly smooth and the notepad is easy to letter in. It’s a little more expensive than the other options, but it’s definitely affordable. You can also get Strathmore Bristol paper and Canson Marker paper (possibly other brands). They are more expensive, but you can find them at Hobby Lobby or Michaels and use a coupon. I don’t use these, but I feel that they are important to mention. Do you agree with my list? What paper do you prefer?